We want to announce that after nearly 40 years of providing dental care for the best possible family of patients, Dr. Blincoe is transitioning to Dental Sleep Medicine. After a “phasing out” period by Dr. Blincoe to complete scheduled cases, Dr. David Shutt will be assuming all of the practice’s dental treatment responsibilities. We anticipate a smooth and seamless transition ensuring a continuation of the best possible patient care as has been the case for the last 29 years. Louisville Magazine's August, 2018 edition focuses on recognizing the top doctors in the Louisville area. 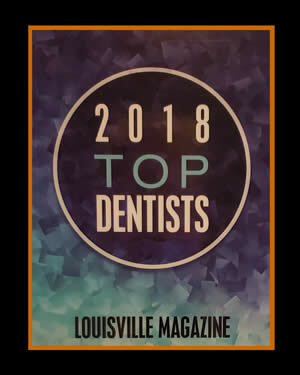 In the category of Top Dentists of 2018, Dr. Glenn Blincoe and Dr. David Shutt have both been named to the list.. This recognition was voted on by Louisville dentists. The distinction is based on the opinions of Dr Blincoe's and Dr. Shutt's peers. Drs. Glenn R. Blincoe and David L. Shutt have built their practice on the foundation laid by Dr. William P. Blincoe who began the practice in St. Matthews the summer of 1952. With over sixty years of combined experience, Drs. Blincoe and Shutt can devise a plan to build you a beautiful smile! They are ably assisted in their work by an experienced staff of dental hygienists, assistants and office staff members. To begin the process of building your smile, give us a call at (502) 895-2210 or e-mail us at blinshut@bellsouth.net.